For over 80 years, Jaguar has been globally renowned as a maker of beautiful sports cars. Cars that have always been relevant, at the cutting-edge of technology and exciting to the senses. The I-PACE Concept is the smartest ve-seater sports car and the start of a new era for Jaguar. It’s as daringly designed and innovative as the cars that put Jaguar on the map, with technology that enhances our customers’ lives. It sets a template for others to follow, just as we have always done. Transportation will change more in the next decade than it has in the past 50 years and we’re prepared for that change. Just as Jaguar always has, we’re ready to give our customers the technology they want and need, when they want it. More than that, we’re making it smarter, cleaner and more efficient. The Jaguar I-PACE Concept is the first step towards our future. The future is now. The Jaguar I-PACE Concept previews a production car that will hit roads in 2018. It will be the smartest five-seater sports car; a performance car, a family car and an SUV all in one. Its groundbreaking design, true Jaguar performance and competitive range and charging times will make it the first real electric alternative to a traditional premium SUV. Jaguar’s design and engineering teams have taken full advantage of the opportunities presented by electrification: a cab-forward, sporting driving position, exceptional interior space and, of course, zero tailpipe emissions and instant acceleration. The battery pack and motors have been designed and engineered by Jaguar Land Rover to deliver outstanding efficiency. With over 500km range on the NEDC cycle, the average user could charge just once a week. Charging is easy and quick, with 80 percent charge achieved in 90 minutes and 100 per cent in just over two hours using 50kW DC charging. The interior features premium materials and beautiful, tactile details that highlight British craftsmanship at its best. There is digital craftsmanship too, with two, super-intuitive touchscreens that serve up information where and when the driver needs it. Packed with proven Jaguar sports car technology, the I-PACE Concept features exceptional ride quality, authentic handling and a 0-60mph time of around four seconds. “No other project I’ve worked on has given me the sheer thrill that this one did.” Ian Callum, Director of Design, Jaguar. With Ian Callum it always comes back to the cars. Indefatigable enthusiasm for cars in general and Jaguars specifically is all part of Callum’s brand. It’s sustained him through a long and illustrious career defined by the creation of timeless, beautiful sports cars; deceptively simple silhouettes he’s gone on to translate into a range of timeless, beautiful sports saloons for Jaguar. The I-PACE Concept is, however, something altogether new: not a traditional sports car, saloon or SUV and absolutely not a traditional Jaguar. Yet his approach to its design is absolutely traditional Callum; it’s informed by a sense of history, his scholarly understanding of form language and, inevitably, that overwhelming sense of enthusiasm. “People tell me they think the car is going to change,” he starts. “Well, as long as we’ve got eyes in our heads and sit the way we do in cars they’re not. What changes with a battery electric vehicle is the absence of mechanical machinery sitting in particular places. That’s the opportunity. Callum is of course best known for front-engined cars, but he’s nothing if not unsentimental. Not to mention adamant. It’s no secret that this is more than just a concept, hence the very public departure from the C-X concept prefix. Consequently, it’s more than just an easy-on-the-eye shape. Callum long ago mastered the art of harnessing aerodynamics without becoming a slave to their unrelenting physics. 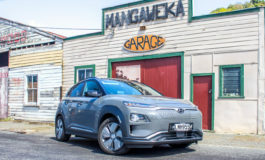 Efficiency in battery electric vehicles manifests itself equally brutally: the more efficient the car, the further the range between charges and largely misplaced anxiety around range has in the past limited the appeal of battery electric vehicles. The I-PACE Concept puts up remarkably little fight against the wind. “Aerodynamics is a huge challenge,” he says. “You can’t deny physics and it’s always a sign of a good designer to ensure that the aero is as efficient as it can be within all the constraints, remembering, of course, that one of the constraints is the aesthetic. “It helped that the car was a whole new type of vehicle and there are no previous references. The profile helps the aero tremendously. If it was a very square, linear car – with vertical lines – the aero becomes naturally much more difficult. The back of the car relative to the front is very high and that is purely driven by the physics. There’s little doubt that Callum has been inspired by the I-PACE Concept. It wasn’t so long ago he was celebrating the launch of the second-generation XF, a landmark redesign as the enormously successful first generation car signalled the beginning of Callum’s refashioning of Jaguar. And it’s very clear – it always is with Ian Callum – that the I-PACE Concept is only the beginning. As he stands up to head to yet another meeting, it’s evident it is not just three-hour blasts in that red F-TYPE putting a twinkle in his eye. “I think what’s really great about this car is that we didn’t set ourselves any rules. Don’t try and make it look like an F-TYPE or give it an E-Type boat tail because that’s nice to have. 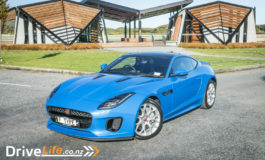 Just accept the fact that this is a whole new vehicle and takes Jaguar’s rules to a whole new level,” he says. The future models taking shape in the Advanced Design studio will have to meet those demands. It’s a challenge that Thomson clearly enjoys, but it’s also one compounded by the fact that, however the design freedom inherent in electric vehicles is exploited, the result must still very obviously be a Jaguar and communicate performance, beauty and agility. The I-PACE Concept makes a very clear statement of intent. The I-PACE Concept’s striking and sophisticated interior redefines elegance and craftsmanship for the digital age, seamlessly blending technology, practicality and beautiful design. “The cab-forward design and electric powertrain were fundamental to the way that we created the interior,” says Alister Whelan, Creative Director, Jaguar Interiors. “They have allowed us to create a spacious and comfortable cabin environment with numerous opportunities for innovative storage and passenger space,” he says. Inspired by the F-TYPE sports car, the interior is driver-focused, mixing Jaguar’s legendary sportiness with the I-PACE Concept’s purposeful stance. The driving position is much lower than a traditional SUV and this is accentuated by the dramatic, cantilevered centre console and slimline perforated seats. Clean and uncluttered, the design combines handcrafted, high quality materials with a light colour palette. The Jaguar design team have also chosen to layer authentic materials for a unique look: dark, unvarnished walnut veneers sit flush with metal inserts to create seamless, textural contrasts. Tactile features and finishes are as beautiful as they are intuitive. A perfect example of this is a new ‘flightdeck’ approach to the cockpit, featuring three screens – two touchscreens in the centre console and a virtual instrument cluster behind the steering wheel. Combine these with the gearshift buttons integrated into the floating metal legs, and it’s easy to see how the I-PACE Concept takes digital technology and usability to a whole new level. To complete the interior, there’s a full- length panoramic glass roof, which floods the interior with natural light. In the daytime, the lozenge-patterned ceramic print matches the interior surface finishes, all to create a stunning visual effect that gives the I-PACE Concept its own distinct character. The I-PACE Concept is the first Jaguar to usher in a new interior design language focusing on features that blend digital craftsmanship with mechanical precision. Throughout the process of creating Jaguar’s first purpose-built electric vehicle, the engineering team worked to a simple, single-minded mantra: the I-PACE Concept had to be a true driver’s car. To reach this goal, the I-PACE Concept features two incredibly compact electric motors designed by Jaguar Land Rover. Integrated into the front and rear axles, they offer a combined power output of 400PS and 700Nm of torque, which is exactly the same torque rating as the F-TYPE SVR. Together they also enable all-wheel drive, improving dynamics and traction on all surfaces and in all weathers. 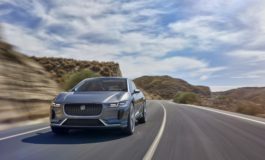 “Electric motors provide immediate response with no lag, no gearshifts and no interruptions,” says Ian Hoban, Vehicle Line Director at Jaguar Land Rover. 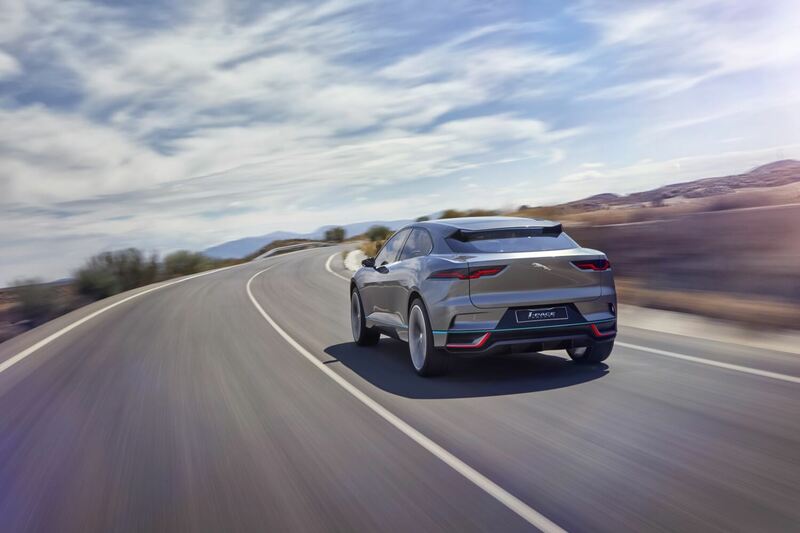 The I-PACE Concept delivers searing performance, unrivalled ride and handling characteristics. To achieve this, it uses the sophisticated double wishbone and Integral Link suspension setup proven in the XE, XF and the F-PACE. It will stop just as efficiently, too: an electric brake booster replaces the normal vacuum servo, ensuring maximum flexibility in the brake system control and maintaining excellent pedal feel. The I-PACE Concept’s electric motors and Lithium-Ion battery are designed to deliver the best possible performance and range. 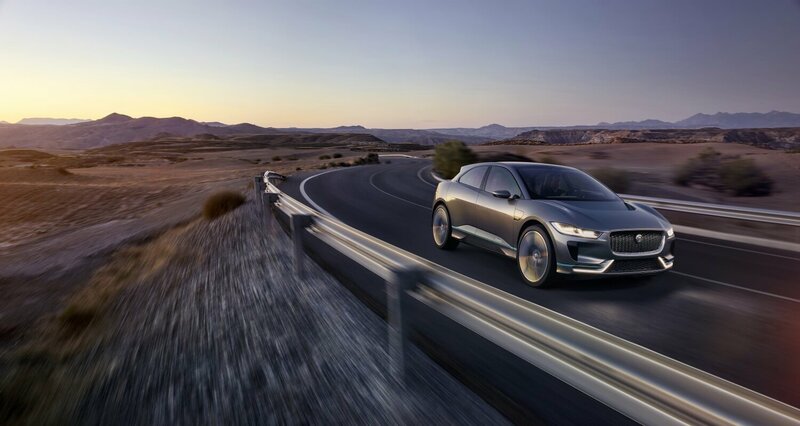 The I-PACE Concept delivers a range of more than 500 kilometres on the NEDC cycle and, using 50kW DC charging, achieves zero-to-full charging capability in just over two hours; 80 per cent charge capacity is reached in just 90 minutes. With this kind of range and efficiency, there’s no doubt the I-PACE Concept is an electric vehicle that will perform in the real world and compete with vehicles powered by the best internal combustion engines.